TNI Bureau: The India Today-ORG opinion polls have predicted a landslide victory for Narendra Modi in Gujarat for the third time in a row. The BJP’s seats will go up to 128 this time, the poll says. The Congress may end up with just 48 seats. However, the survey confirmed that majority of Muslims in Gujarat do not accept Modi. Interestingly, 58% of the total voters participated in the survey, did not hold Modi responsible for the 2002 Gujarat riots. Former CM Keshubhai Patel did not make any impact on Modi’s prospects. The survey was conducted across 36 assembly seats. Also, 56% people in Gujarat endorsed Narendra Modi as the Prime Ministerial candidate, while only 35% rooted for Rahul Gandhi. 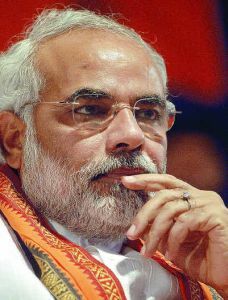 The entire opinion poll proved that Modi remains invincible and undisputed leader in Gujarat.